The Skill Swap invites you to share community, partake in a joined meal and learn from your neighbors and friends. 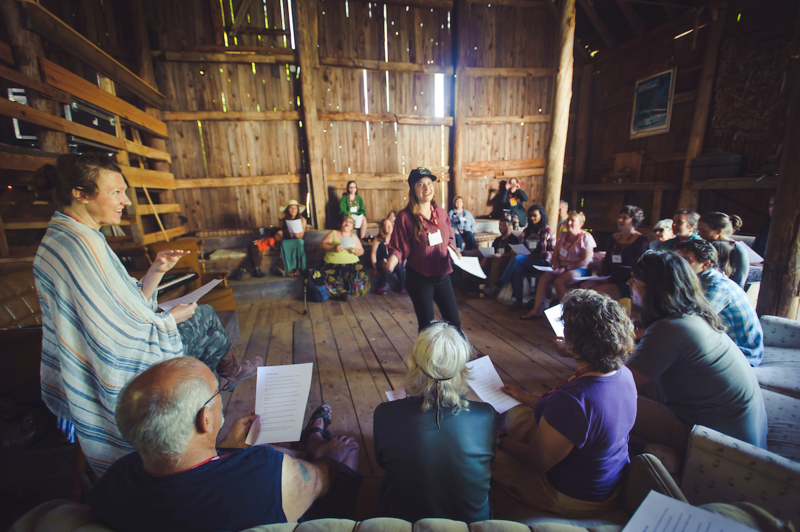 Gather with other curious folks, engage in skill building and moonlight dance at Earthwork Farm. Crosshatch, along with Earthwork Music and Human Nature School, present a full day of hands-on workshops. Choose from 20+ classes in the categories of Earth, Art, Tinkering, the Real Home Ec, Human Nature School and Community Circles. All condensed courses are taught by the community for the community. After a day of swapping skills, stick around for an on-farm, locally procured dinner featuring chef Loghan Call of Planted Cuisine. A full concert in the barn beginning with a contra dance hour, followed by music by Mady Kouyate and Samuel Nalangira rounds out the event. Camping passes on the farm are included in the all-access pass. Early bird pricing is available until April 4th. Regular pricing is available from April 5th to May 26th. 4399 N 7 Mile Rd. This will be a create your own pho bowl dinner that will be allergen friendly for everyone. From going over the basics to, tips from pros, to actually writing a song as a group, this workshop will be an empowering experiential journey through the songwriting process. Walk through the fields and surrounding woods and learn how to forage for plants and flowers to make your own tea—right from your Northern Michigan surroundings. Learn from farmer and beekeeper, Libby Hiser, how to make beeswax food wraps. She will cover cutting fabric of different sizes, mixing proper ratio of beeswax, pine resin, and jojoba oil, melting, and mixture and spreading on fabric. Learn how these wraps can be used for personal use! Learn the art of knot tying. Participants shall tie (and untie) several useful knots: bowline, double hitch, rolling hitch, square, farmer's loop along with other knots of interest. Attendees will also discuss common rope fibers and practice joining two ropes. If a session isn't your speed, join a circle. This circle will be a 90 minute knit-in. Bring your projects and knit with your peers. Or, if you've always wanted to learn, stop by and learn a basic stitch. Learn the basics of contra dance, its structure, common elements/components, and organization; then help create a dance or three for us all to try later in the evening. Learn how to navigate your surroundings using only a compass and the world around you. Jason Stephens will be instructing participants on orienteering and wayfinding using man-made and natural tools (like the sun!). Visible mending is a nod to the traditions of prolonging the life of our clothes and our fabrics through the art of caring for them. Students will see examples of visible mending, talk about mending techniques and mend a piece of fabric to then make into small pouch. Suitable for all skill levels. Chainsaw safety is the basis for this session. Learn how to use a chainsaw, how to do it safely and get some experience with hands-on demonstrations. If a session isn't your speed, join a circle. This circle will be a 90 introduction into non-violent communication. Each person will use 2-3 pieces of watercolor paper for journaling using mixed media. Participants will explore shapes and images seen in the paint that they can later abstract and examine how those images relate to feelings deep within their subconscious. Learn the craft of making fermented (hard) cider. We will discuss apple and juice selection and preparation, fermentation management, use of additional ingredients like fruit and honey, and strategies for packaging and storage. Cider samples included. Learn the basics of how to sharpen knives and safely use them in the kitchen along with different techniques to cut various kitchen items. Through tuning into our 5 senses, playing games and sharing lived experiences we will deepen our awareness, connection, and relationship with the plants and trees. Please Note: although we will naturally be sharing some names and information about the plants and trees, dispensing information is not the focus of this workshop. If a session isn't your speed, join a circle. This circle will be a 90 minute introduction into Kaleidoscope Conversations where only questions can be asked. This lighthearted, meditative, creative session will inspire you to write from a place of presence. Attendees will begin by reading poems by Frank O'Hara, then wander around Earthwork Farm, and finally write, share, and perform our own healing poetry for the group. Come unprepared, open for spiritual exploration! How much water does your garden need? And what's the best way to get it to them? In this workshop, we'll explore a variety of irrigation solutions, including adapting methods common on small farms to your back yard. Join Angie Jackson, The Traveling Elixir Fixer and Midwest Brand Ambassador/Educator for Grand Traverse Distillery for a Wildcraft journey that will feature juniper berries, cardamom pods, bittering agents and other botanicals used in creating your own style of gin, bitters and medicinal tinctures. You will sample these elixirs and take home the recipes and a botanical kit to begin crafting. You will get an introduction to the millennia-old technique of using biochar as a soil amendment. Learn the multiple benefits biochar can bring to soil. Learn several ways of making fire and the plants and trees that can support you as you deepen your relationship with the element of fire. Get hands-on time working with a bow drill and a variety of other fire starting techniques. Some participants may even get their first coal and get to blow it into flame! If a session isn't your speed, join a circle. This circle will be a 90 minute introduction into a traditional Japanese tea ceremonies. Enjoy a silent ceremony and discussion following with tea and sweets. Come to learn, or come to commune.